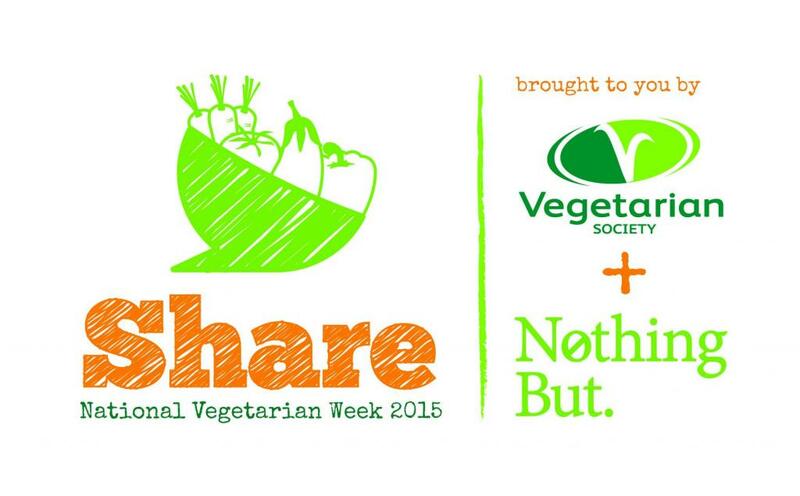 As former headline sponsors of National Vegetarian Week, we know just how important this annual set of events is, both in terms of raising awareness and advocacy of the vegetarian diet and in increasing understanding of the many health benefits following such a diet can bring. 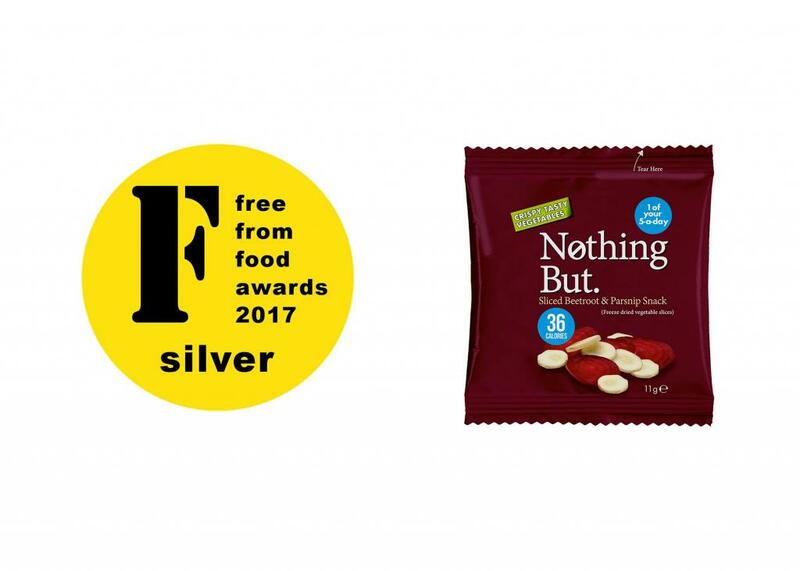 We're delighted to announce that our freeze-dried Beetroot & Parsnip snack won a silver award at this year's FreeFrom Food Awards announced in London last night!! Armed with Nothing But fruit and veg and our stand equipment (okay, and our sleeping gear too! 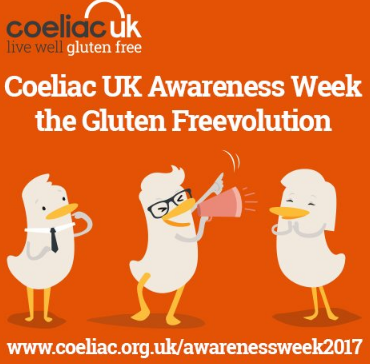 ), we’ve just returned from a visit to Scotland, where we had an awesome time trading at the Allergy & Free From Show in the Glasgow SECC. 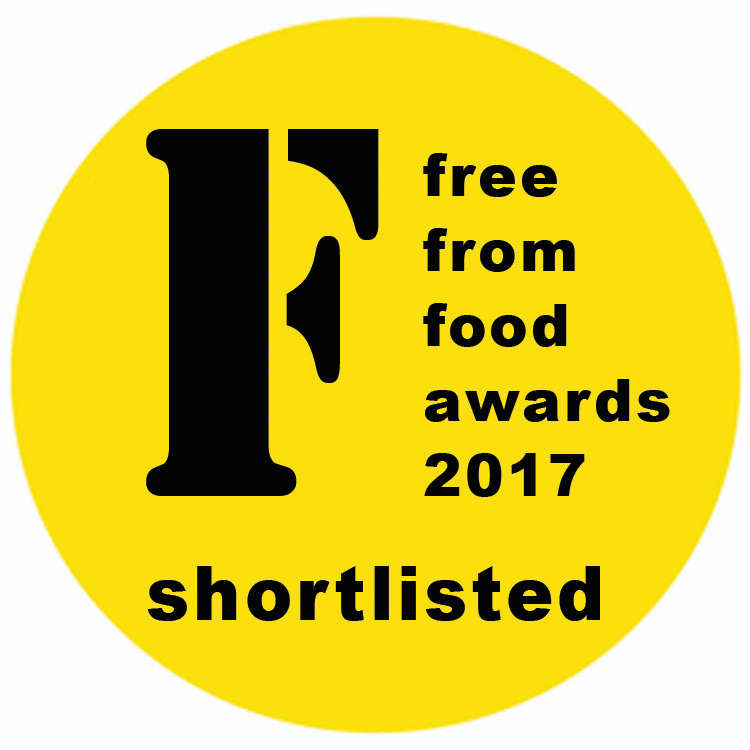 We’re delighted to announce that, not one but two flavours from the Nothing But range have been shortlisted in this year’s Free From Food Awards – the UK’s only industry awards for free from food. 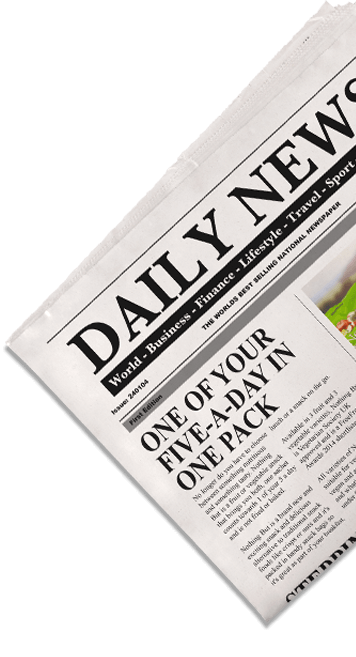 The start of any new year is always a popular time for consumers to consider a healthier and more active lifestyle. 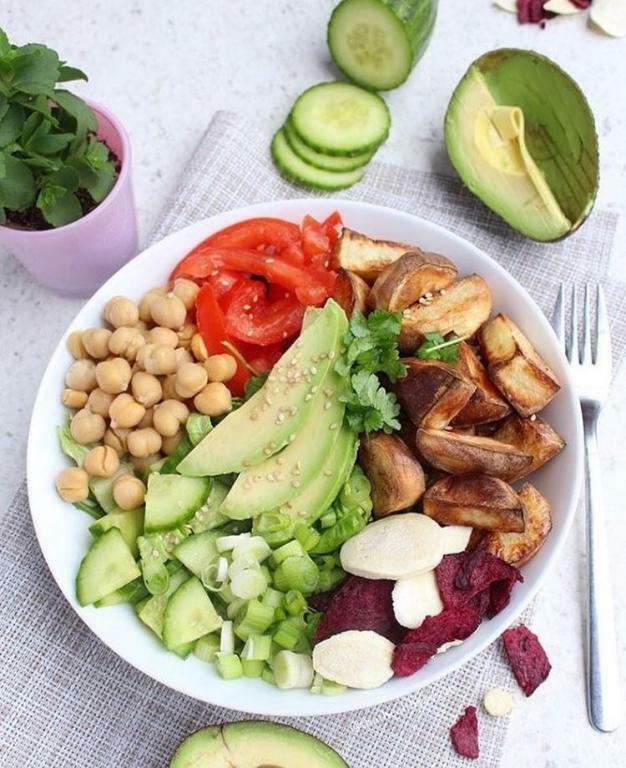 With so many of us becoming increasingly aware of what we’re eating, we decided to reach out to healthy diet enthusiasts on their weight loss journey. 2016 has been another fantastic year for Nothing But, full of accolades, achievements and adventure. 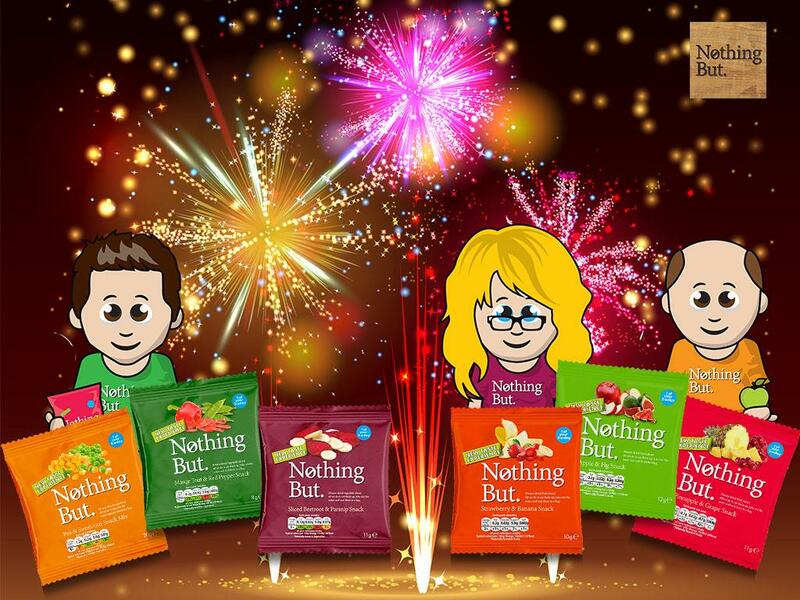 With so much happening at the Nothing But HQ, it’s difficult to condense a year’s worth of activities into just one post – but here goes! 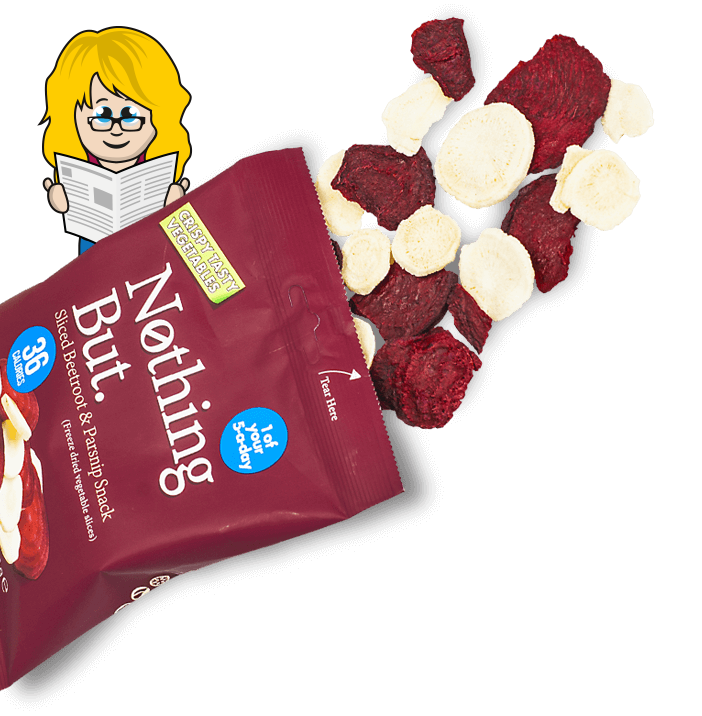 We’re delighted to announce that ‘Nothing But’ snacks has been nominated for another fantastic award, this time for ‘Best Use of Social Media’ at the Northern Digital Awards 2017. 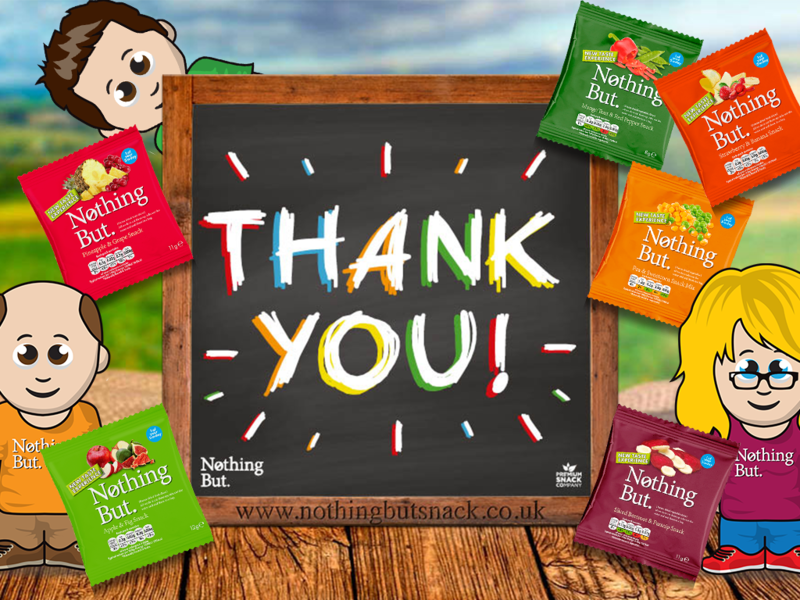 Our delicious, healthy, freeze-dried snacks continue to be enjoyed all over the world in a variety of ways, and we’ve been getting some great feedback both through our campaigns and through our attendance at events all over the country. Please 'Click' to read full article. 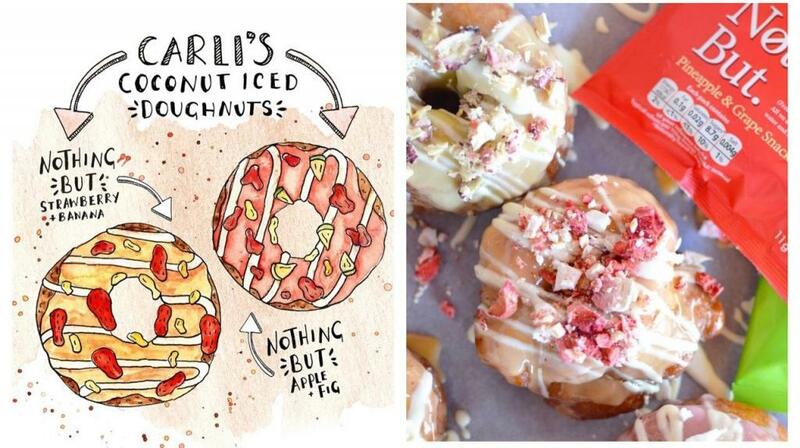 This combo are as perfectly matched as strawberries and cream, cheese and biscuits, pancakes and syrup, Kanye and…. Kanye. 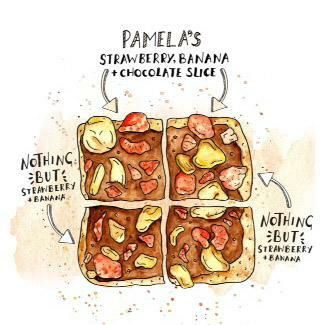 There has never been a more heavenly or indulgent combination than chocolate than and banana – well, apart from chocolate and chocolate, but we feel much less guilty when it’s teamed with some fruit. 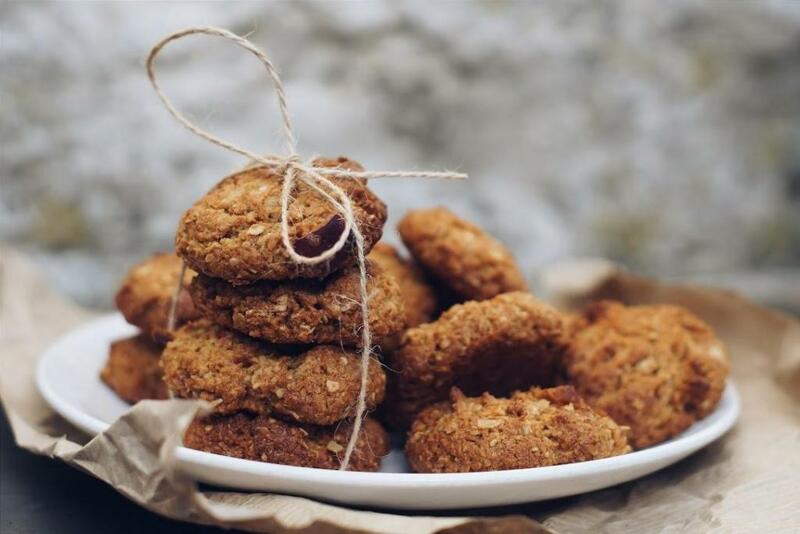 We didn’t need any more of a reason to try them, but then Sam has gone and excelled herself by giving us a simple, quick and delicious recipe that requires nothing more than melting, freezing, sprinkling and, of course, eating! What could be better than a berry tasty strawberry and apeeling banana smoothie? 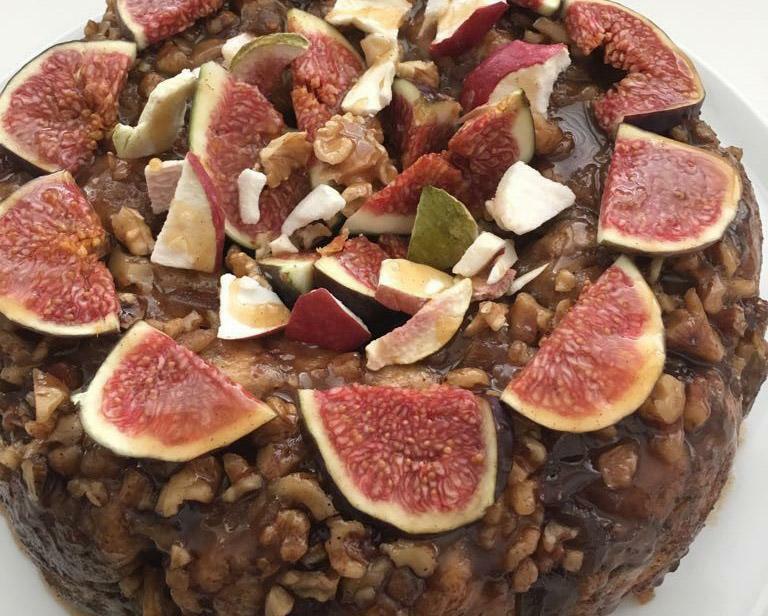 It is a summer staple in our diets, and now our clever friend, Frances has worked her magic to turn it into a cake! 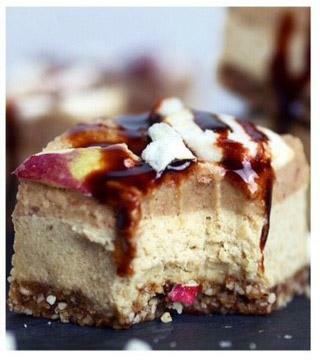 Bursting with flavour and and taking us straight back to chilled out, sunny summer days, one slice of this light and fluffy delight hardly seems enough. 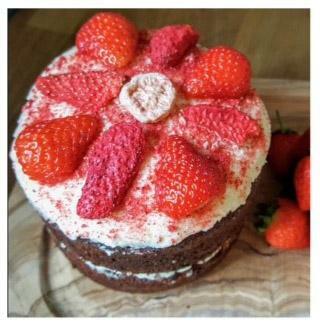 We whisk you all the best at making this cake without drinking the smoothie first! 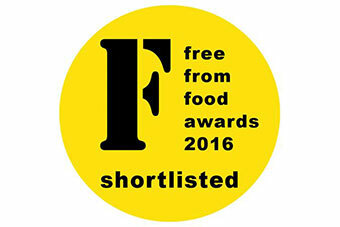 There is muffin wrong with some savoury baking, in fact, we think anything with cheese is grate! Especially these savoury, cheese veggie packed muffins with Nothing But sprinkled on top! 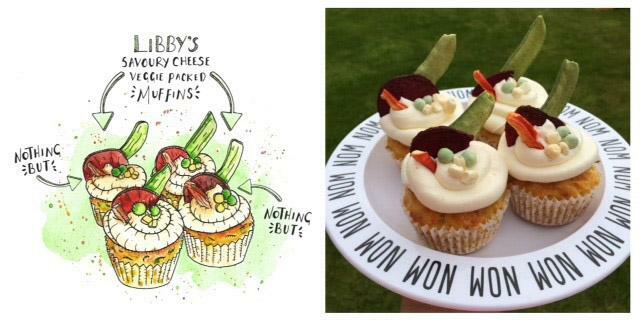 We know some people do not carr-ot-all for veggies, but Libby’s moreish muffins are sure to change your mind! We think these tempting delights will be just perfect with a typically proper brew, or as an impressive addition to a very fancy afternoon tea.. There is nothing better than a relaxing night curled up on the couch watching GBBO, except a relaxing night curled up on the couch watching GBBO with a sweet treat to join in the fun – in this case, a heavenly strawberry and banana chocolate slice! We have come to accept that by September, our summer (if we can call it that in Britain), is very nearly almost over! 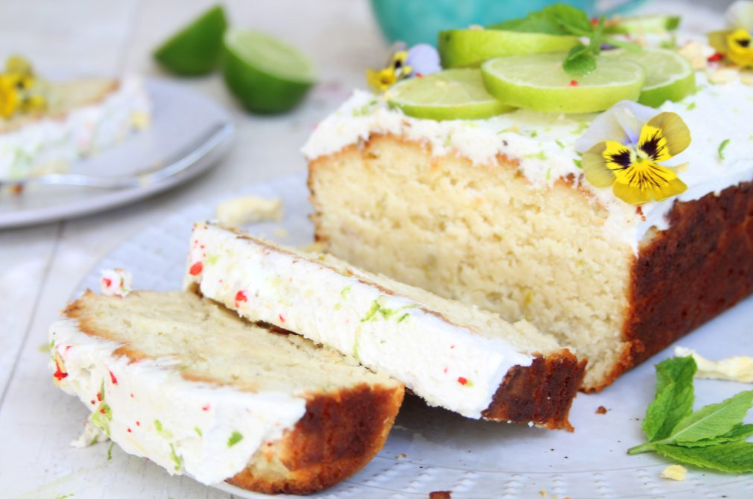 in an attempt to pretend we can hang onto this unexpectedly glorious weather a little longer, baker Sam has created an exotic holiday for our taste buds with her tropical coconut and lime cake. 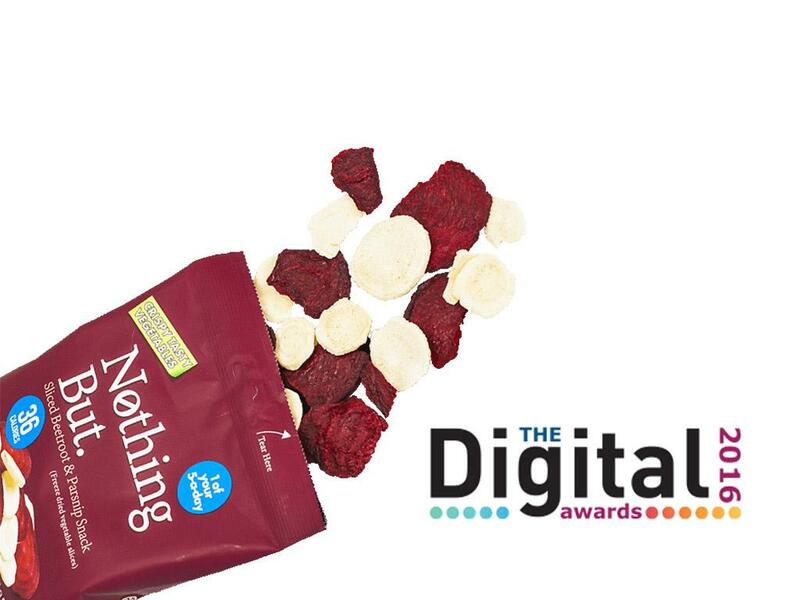 Our Healthy and tasty little freeze-dried snacks beat stiff competition to scoop the top spot in the category of ‘Best Digital Marketing Communication’ at the 2016 Digital Awards last night. So, it’s that time of year again when 12 hopeful bakers enter the infamous Great British Bake Off tent to spend the coming weeks whipping up almost unfathomable culinary creations and trying not to let the pressure of Paul Hollywood’s steely gaze result in a soggy bottom. 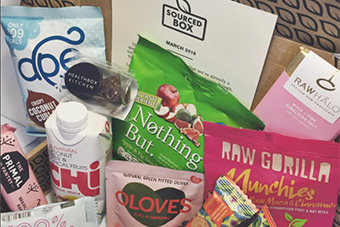 We’ve got a serious spring in our step this March thanks to our latest collaboration – this time with the recently launched SourcedBox, a brand new venture from blogging sensations Niomi Smart and Marcus Butler. 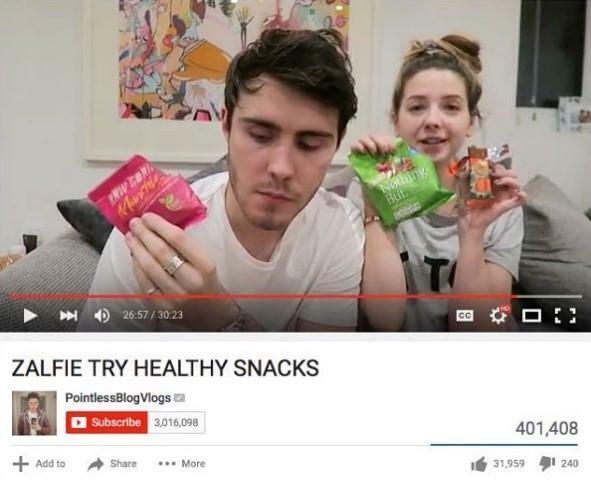 If any of you tuned into The Apprentice on BBC One last night, then you’ll have spotted the current bunch of aspiring business moguls attempting to impress Lord Alan Sugar with their version of a healthy snack. 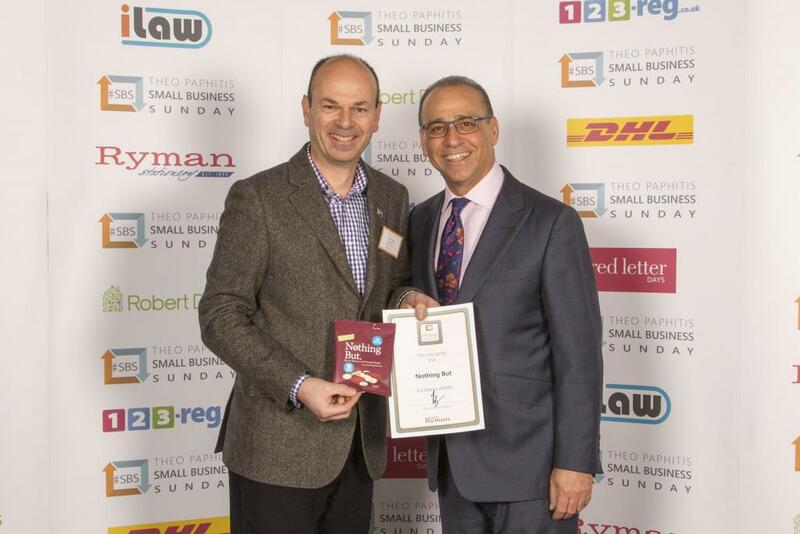 We’re delighted to announce that the Nothing But freeze-dried fruit and vegetable snack range has been selected by Dragon’s Den businessman and Ryman Stationery owner, Theo Paphitis, as a winner of his Small Business Sundays accolade. 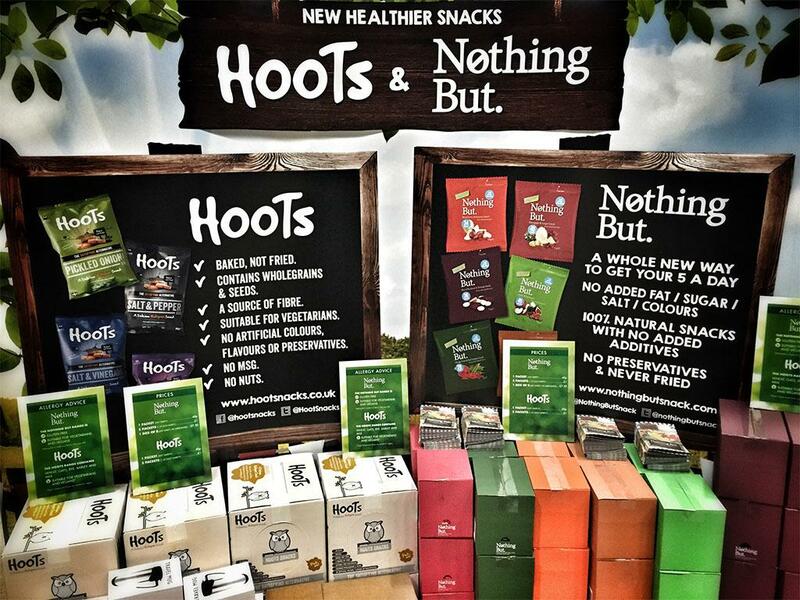 It’s all go go go for the Nothing But team recently!! 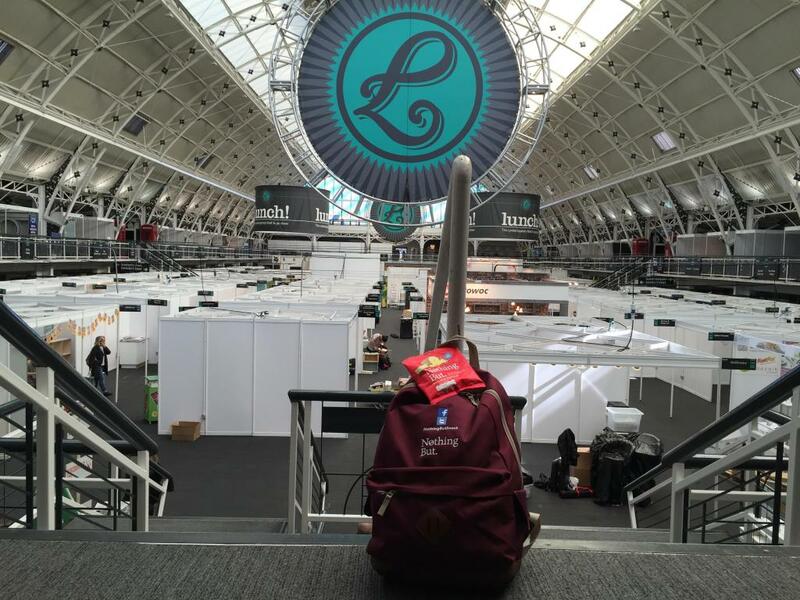 After exhibiting at the Glee gardening exhibition in Birmingham it was soon time to head down south for the UK’s biggest trade show for the food-to-go industry, the Lunch! Exhibition. 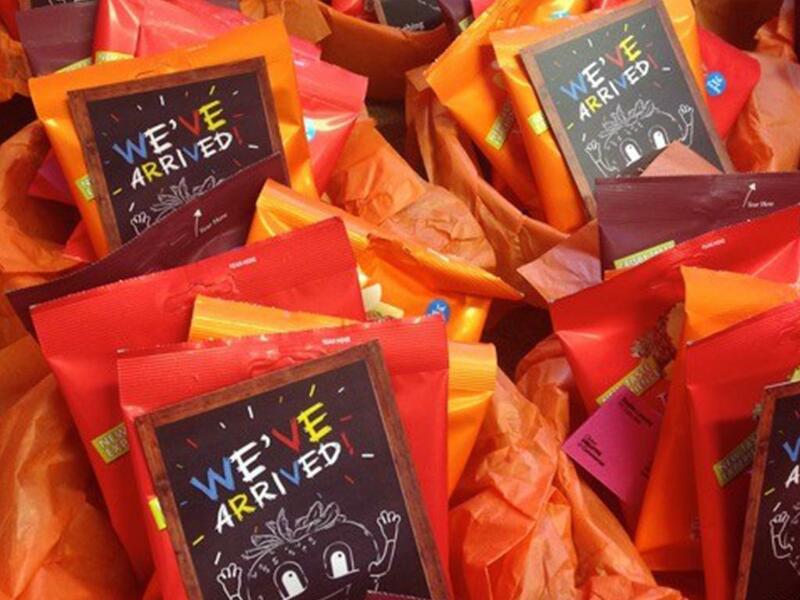 We know that everybody loves a freebie, so, this month, we teamed up with renowned mummy blogger Angela Spicer to give one lucky winner a chance to bag themselves a full range of Nothing But goodies. 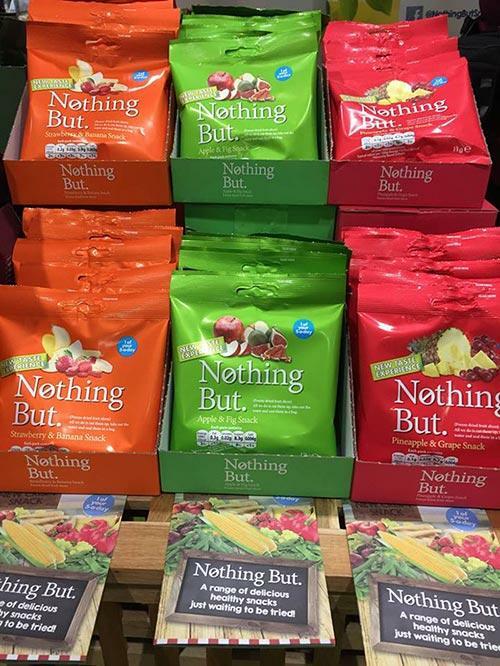 With over 3,200 entries, people are seemingly desperate to get their hands on Nothing But! 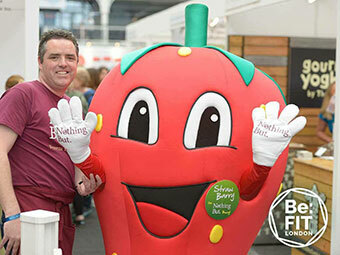 Last weekend, the Nothing But team spent their Friday, Saturday and Sunday exhibiting to thousands of curious foodies at the Just V Show. 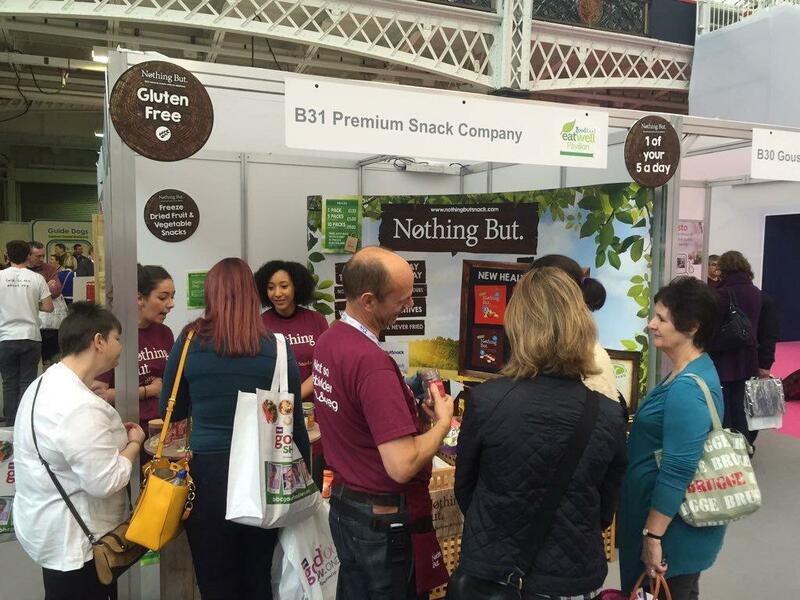 It’s an annual consumer event collocated with the Allergy Show and Love Natural, Love Organic show, so there were a great number of varied visitors. 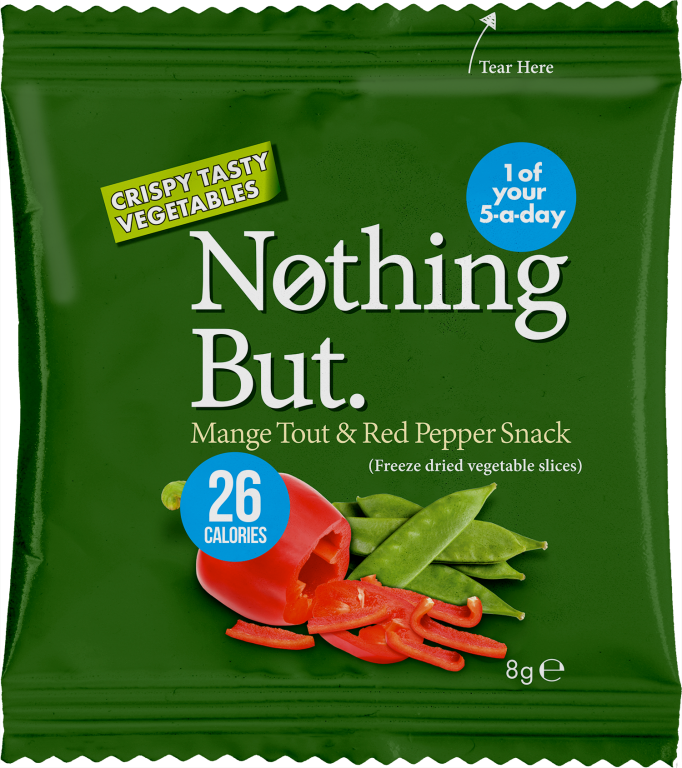 Fruit and vegetable snack brand ‘Nothing But’ have a packed week of activity as headline sponsors of National Vegetarian Week 2015. 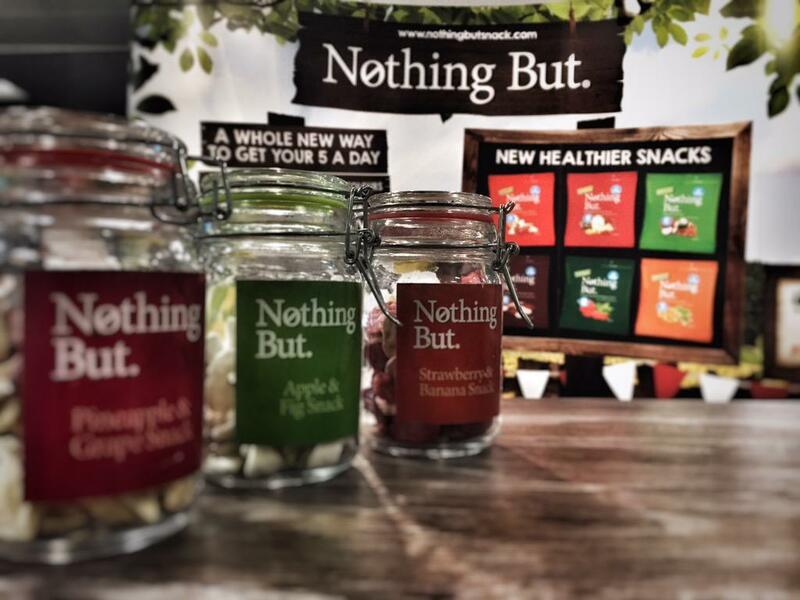 The brand, launched by the The Premium Snack Company in 2014, is undertaking a range of activity across the week to spread the word. 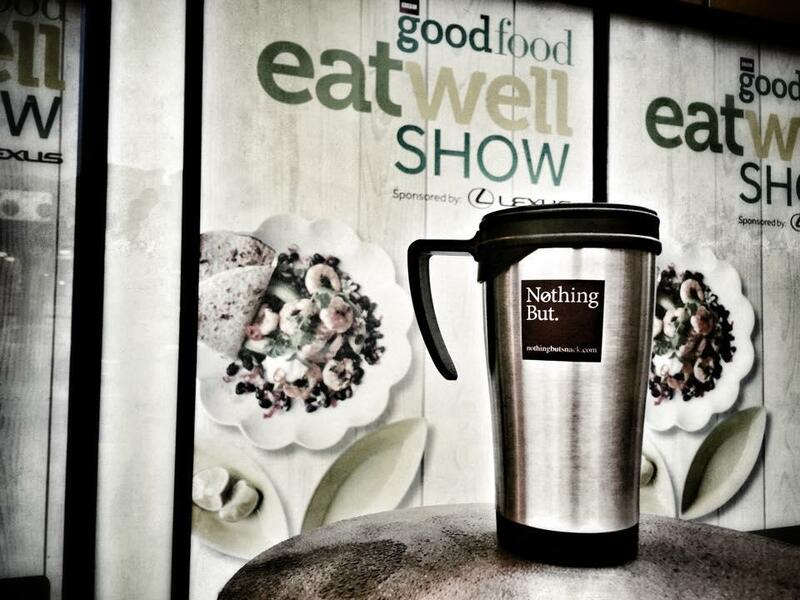 We spent three days at the BBC Eat Well show last week, and what fun it was! 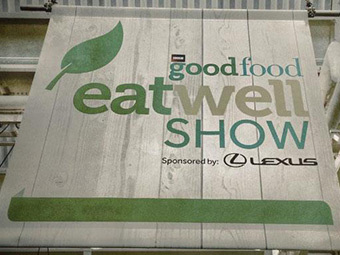 The three day, ‘BBC Good Food Eat Well Show’ is the first of its kind and will be hosted at Olympia, London from 27th Feb to 1st March. 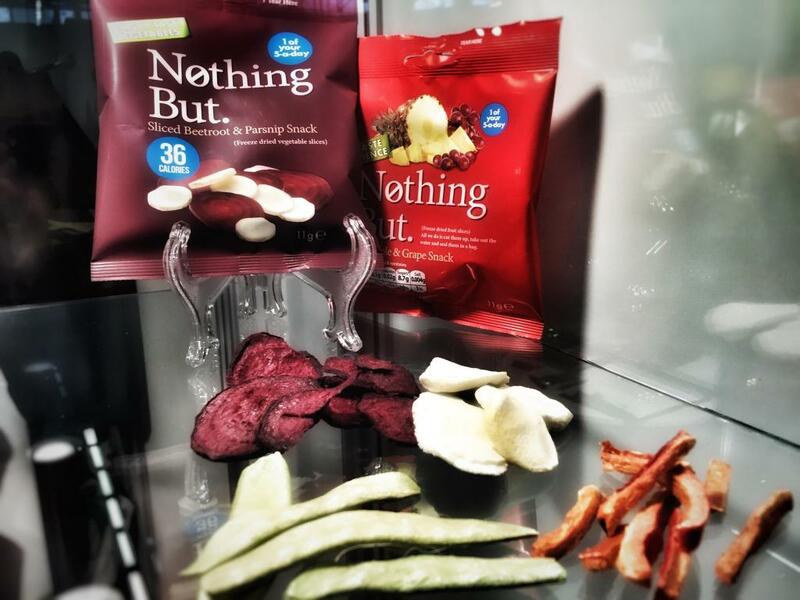 The Premium Snack Company is attending the event to promote their new product range, ‘Nothing But’, and will be encouraging thousands of visitors to sample and buy throughout the event.